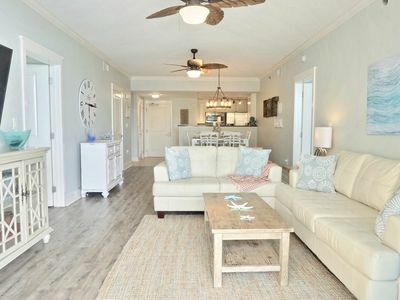 LUXURY 3 bed condo! Lots of extras - total family comfort. Beach service incl. 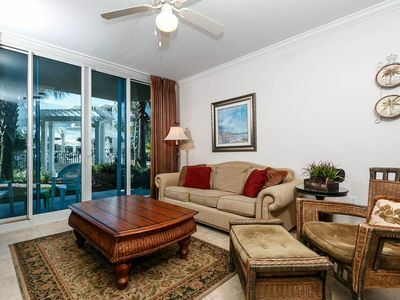 • NO CARPET - Tile in main living and wet areas - Hardwood flooring in every bedroom. 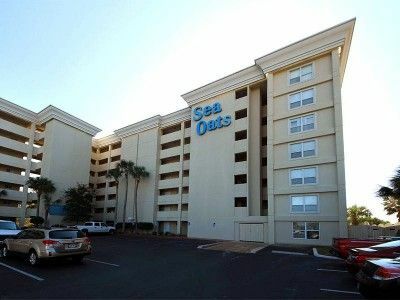 • Spacious quality furniture and comfortable beds! 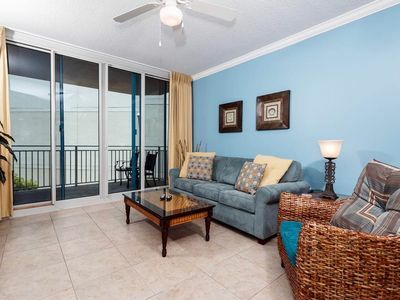 Designer quality furniture on balcony - lots of seating options. 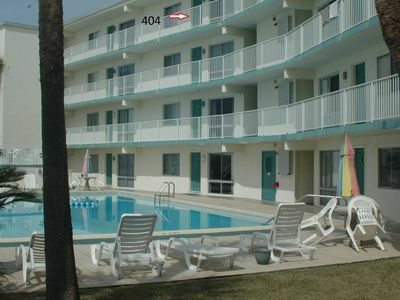 • KING bed in Master, QUEEN in 2nd BR, BUNK beds/trundle in 3rd BR. 1 Single pullout sleeper sofa in living room. Pullout bed sleeps one person. TOTAL of 7 in beds and 1 on single sleeper. 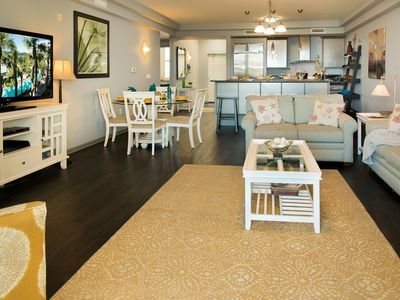 • Over 1,700 Square Feet of space to enjoy. 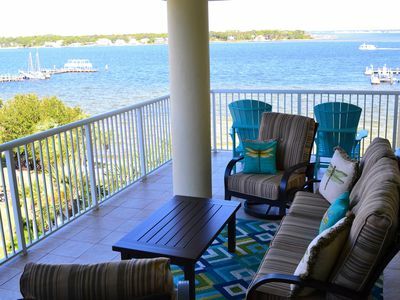 • Large 6th floor balcony overlooking lazy river and bay. • FREE DAILY BEACH SERVICE - One umbrella and 2 chairs provided. 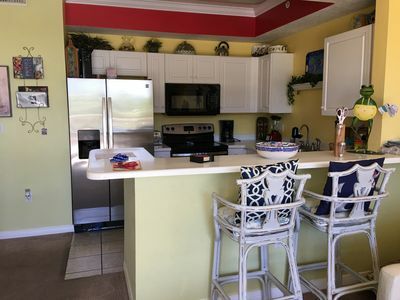 Based on a weekly rental, this would save you $250-$350! Available March 1st - October 31st only. • Beach wagon and beach towels provided for your comfort and enjoyment. 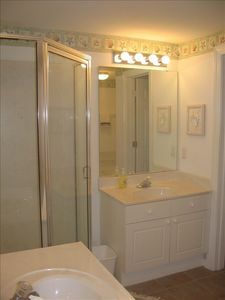 • High Speed private internet access in entire unit. 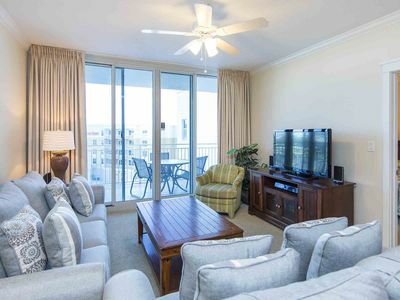 • High Definition Flat Panel TV's in EVERY room. • HD Cable boxes in all rooms & Blu-Ray players in Family & Master Bedroom, DVR in Living Room. Cox cable's On Demand service, HBO, IN EVERY ROOM! • NETFLIX in Family Room, Master Bedroom & Bunk Room. 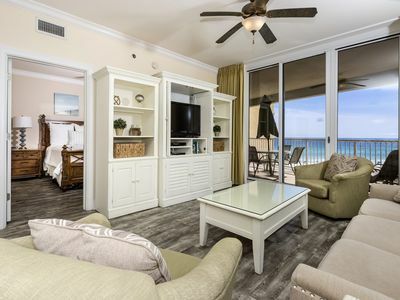 • 700 Ft Lazy River lagoon pool, 2 luxury whirlpool spas, waterfall pool (heated in winter months) private pool for guests in our building (also heated in winter months) onsite well equipped Fitness Center, and children’s play area. • 2 elevators make access to the building convenient, and complimentary parking for 2 cars is included during your stay. • Building carts make loading and unloading your belongings and groceries convenient. 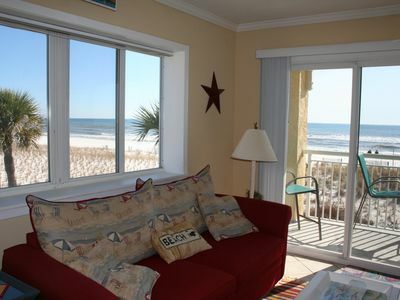 • Beach and ocean access - cross over the bridge to enjoy white sands and ocean waters. 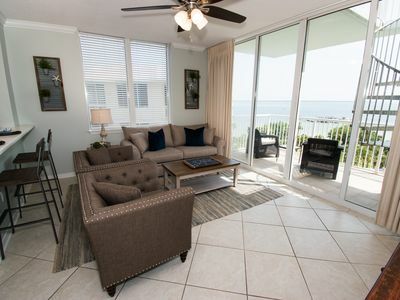 • Additional swimming pools over the bridge on the Gulf side for you to enjoy. 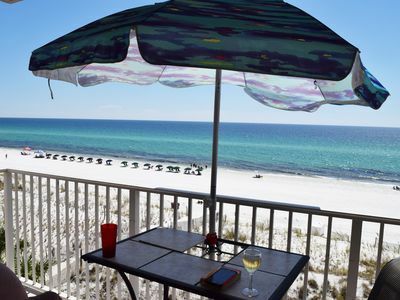 • Nearby are jet ski rentals, parasail rides, helicopter rides, theme parks, putt-putt golf, bungee jumping, go cart rides, beach service, amazing golf courses, kayak rentals, boogie board rentals... great selection of rides, attractions, and ocean activities. 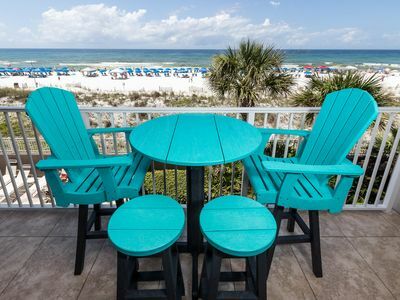 • If you want that little extra in your vacation condo, we have it. 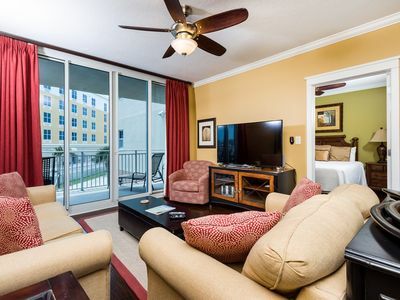 - THIS IS A FAMILY ORIENTED CONDO. 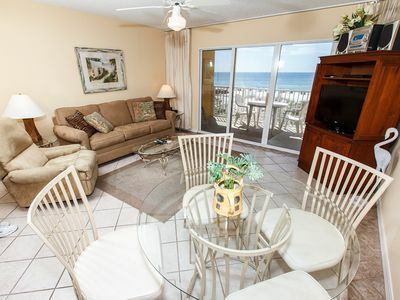 We do not rent to vacationing students under the age of 25 unless accompanied by an adult over 25 years of age. - Maximum of 8 persons allowed. 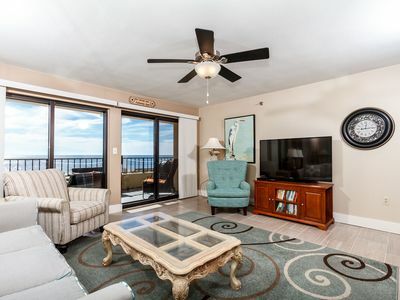 Keywords: Okaloosa Island, Snowbird, Snow birds, Luxury living, great views, Condo, 3 BR, hardwood flooring, no carpets, Large Patio, HD TV, FREE Movie Downloads, Free beach service, 2 bath, Board games, Bay view, 6th floor, Netflix, DVR, Free High-speed internet. Waterscape A330 - Booking spring vacays, now! Azure 520 - Booking spring vacays, now! 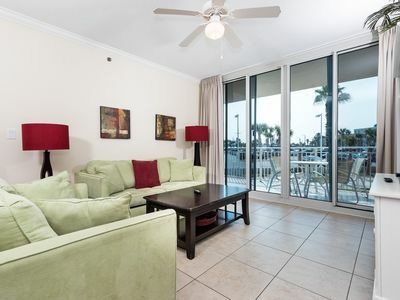 Waterscape A220 - Booking spring vacays, now! Waterscape A133H - Booking spring vacays, now! Waterscape A213 - Booking spring vacays, now! 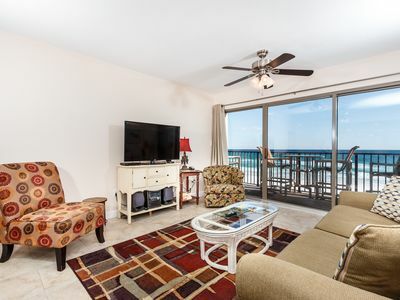 Surf Dweller 205: LARGE Beautifully ~ FREE Beach Service! BOOK NOW! ETW3006:RISE and SHINE on BEACH TIME! WAKE UP TO SUNSHINE! BOOK NOW! 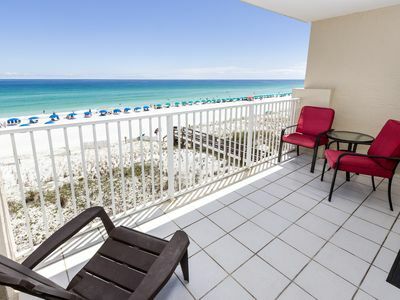 DESTIN WEST BEACH & BAY RESORT! GULF SIDE UNIT! FREE BEACH SERVICE!! !